The victim of a kidney transplant racket has suffered severe blood loss and brain damage. Mr. To Cong Luan, a 22-year-old student, suffered from hemophilia, something surgeons may not have taken into account, according to medical report made up by doctors who treated him at Cho Ray Hospital. 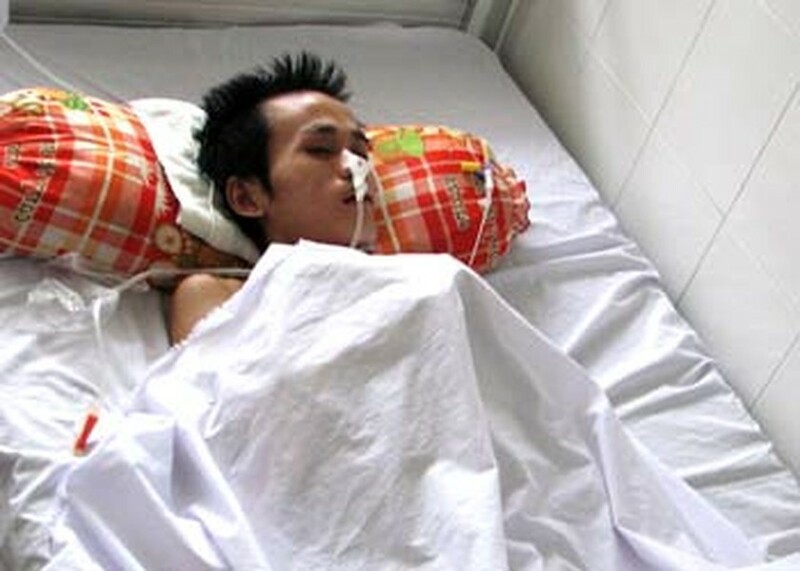 Mr. Nguyen Tan Tai, a kidney patient and deputy director of the city’s Internal Affairs Department, told a reporter from Sai Gon Giai Phong newspaper that he met Mr. Luan in a hospital in China’s Guangzhou province, but denied rumors that he and Mr. Luan had their blood tested and stayed in the same room in Hospital 458 in China. Mr. Tai has just return from China for a kidney transplant. Mr. Tai said that Nguyen Quoc Khanh, the director of People’s Hospital 115 introduced him to a Chinese man named Bach Phong who represents a group that takes kidney patients to China. Thousands of patients suffer from chronic kidney disease, overloading city hospitals. They are using dialysis machines and are waiting for hemodialysis treatment. When kidneys fail, patients need hemodialysis treatment or a kidney transplant to replace their failed kidneys, said Dr. Nguyen The Thanh, who heads the Urology Department of Gia Dinh People’s Hospital. Facilities at Gia Dinh are insufficient to meet demand, Dr. Thanh added. The hospital’s 12 dialysis machines are overloaded, said Dr. Vu Dinh Hung. The situation is much the same at People’s Hospital 115, An Sinh General hospital, Van Xuan general private hospital and Cho Ray Hospital, Viet Nam’s largest, with 500 terminal inpatients. Dr. Nguyen Thi Thu Lanh of Cho Ray Hospital said that she and her medical workers must serve 180 to 200 patients a day, excluding 30 to 40 patients with kidney failures at the emergency room. The hospital currently has 45 machines for the task. There has been an increased demand for kidney transplants. Gia Dinh People’s Hospital performed four kidney transplant surgeries eight years ago, but halted work in 2003 because of the difficulty in finding kidney donors. Because donated kidneys are in high demand, some well-off kidney patients go overseas for a transplant. Gia Dinh People’s Hospital doctors are keeping a close watch on four persons who underwent kidney transplant operations in China. Two of them already have signs of kidney failure again. Some 134 operations have been done in Cho Ray Hospital since 1992. The donated kidneys are from living related donors such as a parent, sibling, or child of the recipients. Also at the hospital, 200 overseas-operated recipients are treated. The success rate is 60 percent. What worries Dr. Tran Ngoc Sinh most is that the relatives of some patients may buy a kidney from a stranger and then introduced him as a distant relative who will donate a kidney in-country or overseas.